Special Treatment Bakugan are Bakugan made of special colors and sometimes have special attacks. Some are also exclusives from the top sellers of Bakugan, Target and Wal-Mart. The Pearl Bakugan takes on the color of pearl white, hence the name. They are not entirely white, however, as the Bakugan are outlined by the color of the Attribute it takes on the field. The Attribute symbol is also on the Bakugan. The Pearl Bakugan was originally released in Bakutins, but it was released again with the BakuFrost and the Crimson and Pearl series. The BakuFrost series has Bakugan looking all white like snow. They function like the Pearl Bakugan when in a brawl. The Crimson and Pearl Bakugan also follows the same rules as the BakuFrost and Pearl Bakugan. The Crimson and Pearl Bakugan are Target exclusives, and are red and white in appearance. Clear Bakugan are clear and transparent in appearance, with no Attribute at all. When used in a brawl, the player using a Clear Bakugan will have to take the opponent Bakugan's Attribute as his. The BakuCrystal series feature Crystal Bakugan, which is similar to the Clear Bakugan because of their crystal clear appearance. The Translucent Bakugan are Special Treatment Bakugan known for its transparent appearance. Under the Translucent Bakugan, we have the BakuLyte series, the BakuNeon series, the BakuGlow series, and the BakuSolar series. 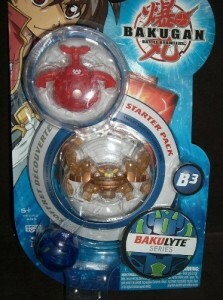 The Lyte Bakugan is just another name for the Translucent Bakugan. The other three series have significant differences from one another. The BakuNeon series features translucent Bakugan with neon bright colors. The BakuGlow Bakugan are almost the same with the usual Translucent Bakugan, only they are darker in tone. The BakuSolar Bakugan are transparent orange in color, with yellow highlights. The Dual Attribute Bakugan are Bakugan with two Attributes. They were released in the BakuSwap series. The official releases of this series only include the Six Legendary Bakugan Warriors, Wayvern, and Naga. The BakuBronze series was released after the BakuNeon series. The highlight of the BakuBronze was the gold-colored appearance of the Bakugan. The Bronze Attack Bakugan are a Special Attack series that are only sold at Wal-Mart. There are only nine Bronze Attack Bakugan released. The pack comes with a special Bronze Ability card, and the Bakugan has an Attribute symbol and G-power on it. Bronze Attack Bakugan have the ability to get extra G-Power from the opponent's Gate card. This series was not released in North America. The BakuMutation series features Bakugan that is half normal (with Attribute color) and half clear. 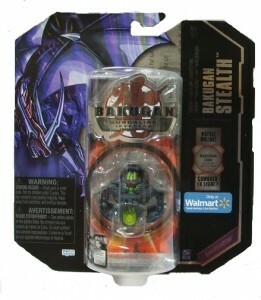 The BakuStealth series is Wal-Mart exclusive.There are four groups of Special Treatment Bakugan in this series. The BakuShadow Bakugan have a much darker color tone than the regular Bakugan. They usually carry the Darkus Attribute. There were two kinds of BakuGranite Bakugan released by Wal-Mart. The first was colored like a stone with small black dots everywhere on the Bakugan. The second was colored dark red, also with small black dots. The BakuCamo series got its name from "camouflage," which is the theme for this set of Bakugan. The Bakugan is designed in a different color so that it appears to be camouflaged when in a real battle. One design showed a Helix Dragonoid in black, with patches of light green and dark greed, like that of army uniforms. The BakuBlue Bakugan is characterized by its light blue color, with yellow as the secondary color. It was released some time when Wave 4 of the Gundalian Invaders Bakugan was out. It is classified as Aquos in Bakugan Dimensions. Purchase Special Treatment Bakugan Below.